A choir of 12 young professional singers is staging an afternoon ‘Flash Mob’ performance in Poole High Street before performing a formal after-dinner concert at East Holme near Wareham. Hoping to hit the right note with shoppers and diners alike, the Wessex Consort is ready to sing for its supper twice on 18 February. “We wanted to have some fun with the people of Poole by way of a warm up before the evening performance by the lake at Holme For Gardens,” says Graham Stansfield, composer and the choir’s founder. On Saturday 18 February, choir members will be sitting with customers at Wesley’s community café at The Spire, a converted church on Poole High Street. 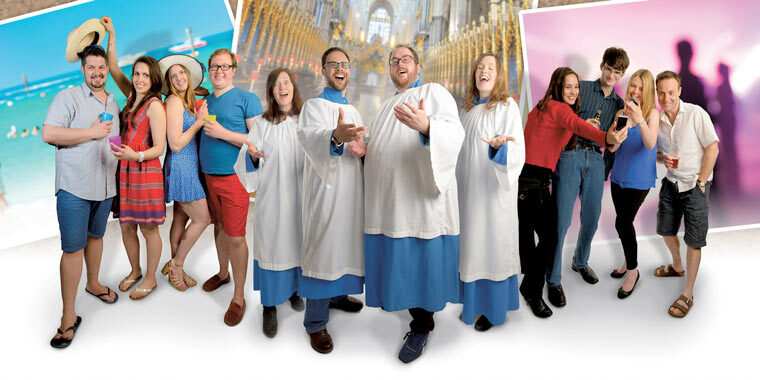 At 2pm, under their distinguished conductor Andrew King, they will spring into action and perform a short programme including ‘Le Train’, a gospel number entitled ‘Sing Hallelujah’ and ‘Gastronomic’, a celebration of good food and drink, both composed by Graham and included on their latest CD A Choir For All Seasons. After the warm up at Wesley’s, the choir will give a 3pm matinee concert at The Spire with admission by donation (suggested £5) and that evening from the Wessex Consort, with Andrew King conducting, will perform an after-dinner concert at the lakeside Holme For Gardens restaurant at East Holme, presenting a varied programme of musical portraits of Dorset life.